Sugar Cream Pie by Sarah Strierch. Boston Cream Pie may have found its way into our shared dessert lexicon, but what about Hoosier Cream pie? Or Indiana Persimmon Pie? News of these regional treats had never reached me before I heard this lecture by pastry chef Paula Haney. Haney has cultivated a devoted following in Chicago with her perfect pies – lemon chess; pork, sage and apple; lattice topped blueberry – since founding Hoosier Mama Pie Company in 2005. Now, Haney unveils the secret history of Indiana pies, from the Amish inspired “desperation pies” of her Indianapolis youth, to pies made from exotic native fruits like the wild American persimmon, paw paw, and custard apple. If you want a taste of Indiana’s official pie, Hoosier Mama carries it at their Chicago shop. 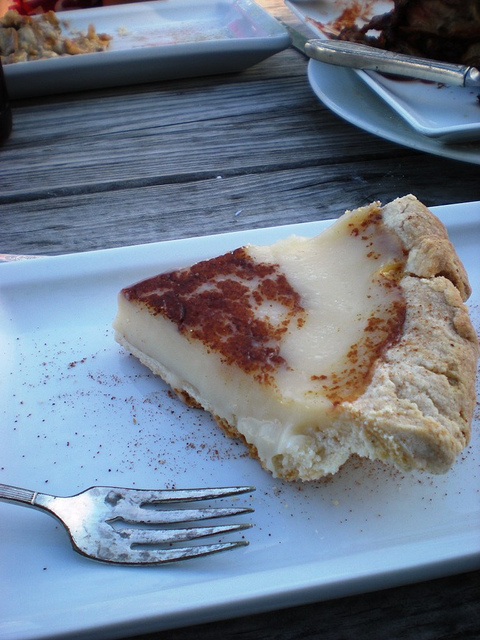 Or, you can go on a pie pilgrimage and follow the Hoosier Pie Trail! Better yet, make your own, using a recipe like this one from Turkey Creek Lane. Click here to hear the rest of Haney’s talk, including a section about the South Side’s endangered pie species, the bean pie. Sponsored by Chicago Culinary Historians, and recorded by Chicago Amplified, a program of Chicago Public Media.